Travel Tips – All the best places to go and see that we recommend in Bali. We can take you there! 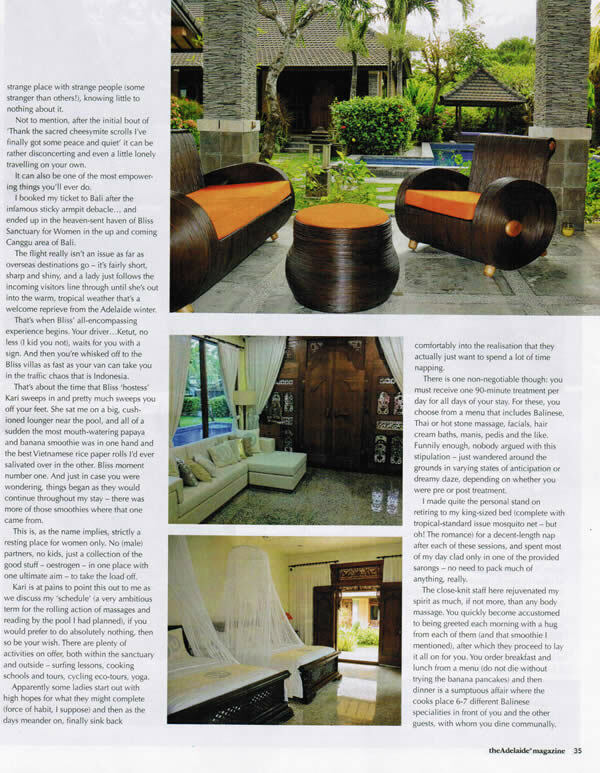 Ubud Sanctuary Bali Retreat – Our newest most luxurious sanctuary amidst a gorgeous tropical rainforest. A spiritual Haven with the best modern amenities. An ultimate yoga retreat and relaxation retreat immersed in nature. Spa Experience – Taking your experience beyond a normal Spa Retreat into the realm of wellness, health and wellbeing. Our unlimited treatments give you the most relaxing Spa holiday you could ever want for. The time you spend luxuriating with massage & spa treatments is up to you. Wellness Bathing – Our signature Bliss luxury relaxation comes to life with our unique wellness retreat bath menu full of ultimate luxurious delights. From amazing cultural flower baths, to mineral salt infused and aromatic delights to calm your senses and soothe your body mind and soul. Bliss Blog – Our Bliss blog related to all things Bliss Sanctuary plus some of our founder Zoë’s personal blog posts. Bliss News – Get the insiders tips on all things Bliss. Recipes, Bali, meet our staff and other blissful tidbits for your everyday life. It’s all about your bliss not about us. Group Bookings – Have you ever wanted to run your own retreat but never known where to start? Bliss Sanctuary For Women, empowering women to travel solo with a tailored Bali retreat holiday just for you. Follow your bliss your way with an experience completely tailored to you. More than a retreat for women, it’s your personal time out for rejuvenation and wellness. This Bali holiday is free of group schedules so you can choose to do as much or as little as you like. From unlimited sightseeing, unlimited massages, unlimited yoga, meditation, healers, plentiful and yummy food, shopping, personal drivers to take you anywhere you would like to go… it’s all up to you. Check out our Bali Packages and remember they are all completely flexible so you can change anything you would like once here. Find Your Bliss in Bali - New Idea Associate Editor Holly Richards swapped deadlines for massages at this women-only retreat. With spring being the season of blossoming and renewing, doesn't the idea of retreating to discover yourself sound appealing? Responding to world travel trends, Bliss Sanctuary offers more than a breathtaking Bali retreat – it’s a sanctuary. Working out suddenly doesn't seem such an effort when you do it in paradise. The Best Female-Only Retreats. Travel unaccompanied to these sanctuaries of relaxation without feeling alone. Josie Gibson: I get “fat fear” and weigh myself every day. Women’s Retreat Is Ultimate Bliss. 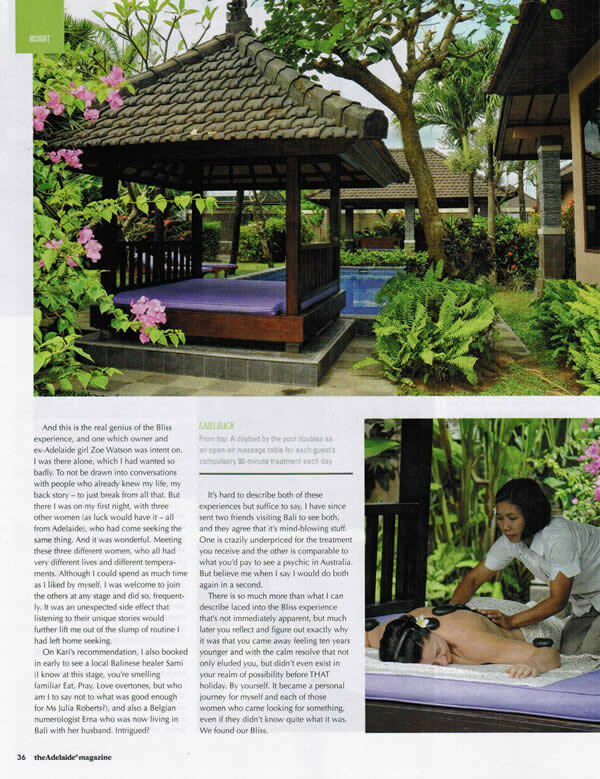 Ladies, forget the Kuta rat-race and discover a serene sanctuary where it’s all about you. If you think Bali is all about beer, braids and bogans then think again, says Jessica Martin. 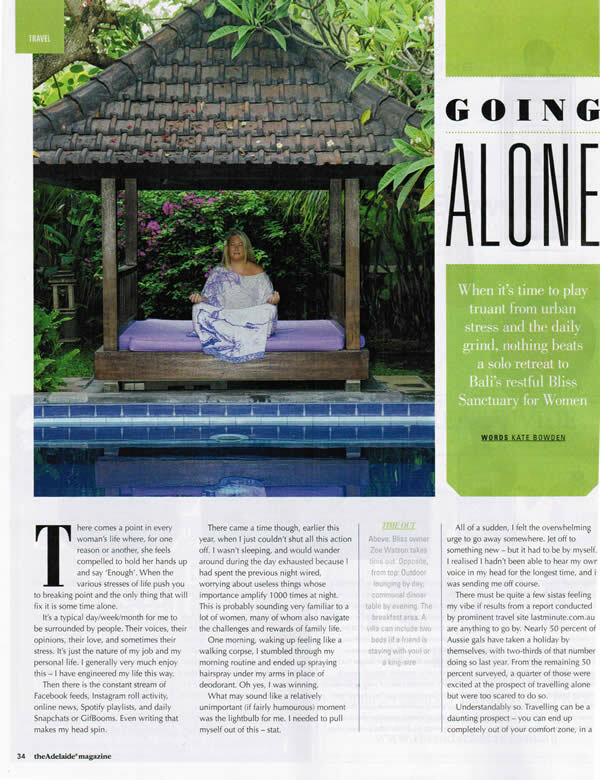 Bliss Sanctuary For Women welcomes women travelling alone to Bali looking for a peaceful sanctuary with no couples and no kids.